The Marine Forces Reserve (MARFORRES or MFR), also known as the United States Marine Corps Reserve (USMCR) and the U.S. Marine Corps Forces Reserve, is the reserve force of the United States Marine Corps. It is the largest command in the U.S. Marine Corps. Marines in the Reserve go through the same training and work in the same Military Occupational Specialties (MOS) as their active-duty counterparts. Marine Forces Reserve is the headquarters command for approximately 40,000 Reserve Marines and 184 Reserve Training Centers located throughout the United States. The mission of Marine Forces Reserve is to augment and reinforce active Marine forces in time of war, national emergency, or contingency operations; to provide personnel and operational tempo relief for the active forces in peacetime; and to provide service to the community (for example, through Toys for Tots). 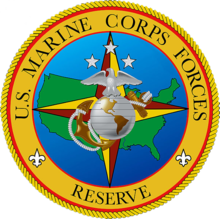 The United States Marine Corps Reserve was established when Congress passed the Naval Appropriations Act of 29 August 1916 and is responsible for providing trained units and qualified individuals to be mobilized for active duty in time of war, national emergency or contingency operations. Marine forces Reserve also provides personnel and operational tempo relief for active component forces in peacetime. MARFORRES comprises two groups of Marines and Sailors. The first, known as the Selected Marine Corps Reserve (SMCR), are Marines who belong to reserve units and drill one weekend a month and two weeks a year. The second group is known as the Individual Ready Reserve (IRR). The IRR is composed of Marines who have finished their active duty or USMCR obligations, however their names remain on record to be called up in case of a war or other emergency – the Individual Ready Reserve is administered by the Marine Corps Individual Reserve Support Activity. IRR Marines participate in annual musters to check in with the Corps. Reserve units utilize infrastructure when mobilized through Reserve Support Units (RSU) located at various bases throughout the U.S. (such as Lejeune, Pendleton, Miramar, Quantico, and Twentynine Palms). Enlistment in the Marine Forces Reserve occurs through a process similar to that for enlistment in the regular active Marine Corps. Recruits must take the ASVAB, pass a comprehensive physical exam, and be sworn in. They may enter through a billet in the Delayed Entry Program (DEP). Reserve Recruits currently attend recruit training along with active duty recruits, earning the title United States Marine upon successful completion of the training. They then have a mandatory leave of 10 days (up to 24 if they volunteer for and are assigned to recruiter's assistance, although, reservists are not usually given RA) before further training at the School of Infantry (SOI) and their designated Military Occupational Specialty (MOS). Only after completing the training program(s) does a Reserve Marine's enlistment begin to differ from that of an active duty Marine. There is a program called the Select Reserve Incentive Program (SRIP), which provides enlistment bonuses for Reservists enlisting for needed MOSs. Half is payable upon completion of training and the other half is spread out over the term of enlistment. For those who have earned a college degree, the Reserve Officer Commissioning Program (ROCP) provides a path into the Marine Corps Reserve leading to a commission as an Officer of Marines. Upon selection from a regional Officer Selection Office (OSO), applicants attend Officer Candidate School (OCS). Upon successful completion of OCS (10 weeks OCC-R), candidates are commissioned Second Lieutenant and subsequently attend The Basic School (TBS). Following graduation of TBS and follow-on MOS training, officers report to their reserve unit where they will serve their Reserve drills and Annual Training requirements. Reserve Marines enlist for eight-year terms. There are three options on how these terms may be served, one of which is designated upon enlistment. 6x2 – Under this option the Reservist spends 6 years in active drill and fulfills the remaining two in Individual Ready Reserve (IRR). This is the only option which makes Reservists eligible for the benefits of the Montgomery GI Bill, and is also the most common. 5x3 – Under this option the Reservist spends 5 years in active drill and fulfills the remaining three in Individual Ready Reserve (IRR). 4x4 – Under this option the Reservist spends 4 years in active drill and fulfills the remaining four in Individual Ready Reserve (IRR). After serving several years in the Reserves and attaining leadership rank it is possible for an enlisted Reservist to receive a commission through the Reserve Enlisted Commissioning Program (RECP). Marines who have previously served on active duty, whether officer or enlisted, can join the Select Marine Corps Reserve directly. Veteran Marines wishing to do this go through a Marine Corps Prior Service Recruiter. The mission of the Prior Service Recruiter is to join members from the Individual Ready Reserve to SMCR units close to their home. Marine reservists are allowed to serve simultaneously in the United States Marine Corps Reserve and in the naval militia of their state of residence; however, when called into federal service, reservists are relieved from service and duty in the naval militia until released from active duty. ^ "Department of Defense (DoD) Releases Fiscal Year 2017 President's Budget Proposal". U.S. Department of Defense. 9 February 2016. Retrieved 11 February 2016. ^ "Marine Corps Reserve" (PDF). defense.gov. Retrieved 12 March 2019. ^ "MFR units index". Archived from the original on 7 September 2008. Retrieved 28 July 2008. ^ Military Professional Development Center. Military.com. Retrieved on 2013-07-23. ^ a b c Marine Corps Recruiting Command[permanent dead link]. Marines.usmc.mil. Retrieved on 2013-07-23. Wikimedia Commons has media related to United States Marine Corps Reserve.